G-force Consulting Engineers BV (G-force), incorporated in the Netherlands in 2001, was established as an OEM to the World’s Largest Manufacturer of Industrial Centrifuges. G-force undertakes turnkey projects directly related to the requirements of oily waste management for oilfield and marine operations. Our turnkey obligation includes oily waste excavation, oily waste treatment, oil recovery and oil purifying to specification for recycling of oil, treatment of water for re-use or disposal and finalizing the decommissioning of oily solids and soils for return to nature. 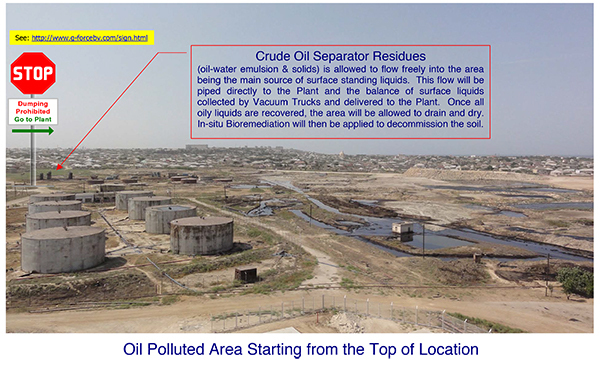 Recovered oil, treated water and decommissioned solids are achieved in strict compliance within the regulatory specifications applied and established either through the Buyer’s directives or the Environmental Authority in the region where a G-force facility is operational. Clients interested to engage G-force should present its waste data so that we are able to appraise its characteristics, or if a Client requires, G-force can provide its services to survey and classify the waste. With this information G-force can then proceed to design the waste treatment facility needed. The ensuing plant design is based on our years of experience and technical knowhow through involvement with over 74 installations worldwide. With the correct plant design, finalized in agreement with the Buyer, G-force proceeds to fabrication and manufacturing followed by packing and delivery of the plant to the operations site location for installation and commissioning. Immediately following, the G-force assigned engineer will start-up operations and begin processing the Buyers’ waste. Simultaneously, he will train the locally assigned engineers to ensure their operational competence at handover of the plant. Once handover is accomplished, this concludes our turnkey obligations, and activates the one-year Mechanical Warranty as provided to all G-force Clients.